FCC Licensed Technicians are a Critical Difference in Court Challenges. 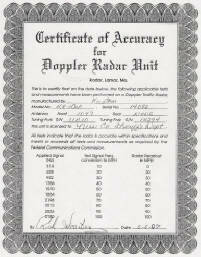 All Radar Certifications are not equal! Sometimes Saving a Few Dollar$ Can Cost a Lot! South Dakota, Texas, Utah, Wyoming, Louisiana. available - the unit may be removed and certification can be performed inside the department. next scheduled service trip through your area. It will only matter when you need it the most! We are the country's largest on-site radar service provider. Trusted by hundreds of Law Enforcement Departments for thousands of Certifications year after year! Standard Certification for All Makes and Models of Lidar / Laser will be one price. 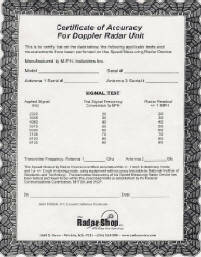 Standard Certification for All Makes and Models of Doppler Radar including Tuning Forks and dual antenna units will be one price. You Can Send It To Us Too! We accept Radars and Lidars sent to us for Standard Certification with a next day (business days) turn around time!